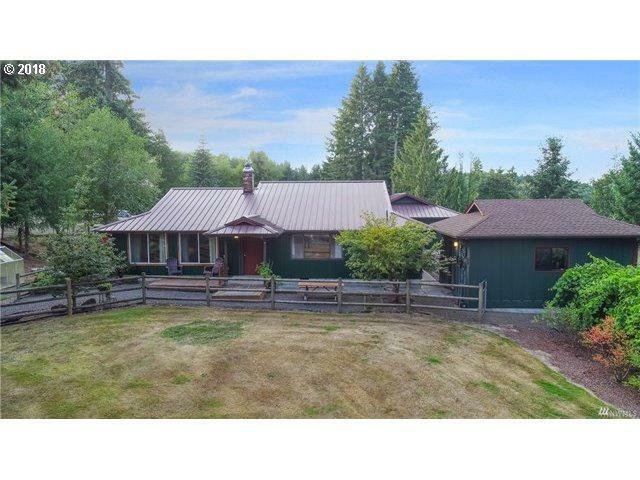 Tranquil retreat on a private lake with spectacular views of Mt Rainier! A piece of NW paradise boasting a "1984" built single level 1,372 SF home plus a 320 SF fully finished man cave/craft room, 3 bdrm, 2 bthrm, living rm w/new wood stove, dining rm, spacious kitchen w/laminate floor, vinyl windows, heat pump, 768 SF detached 3 car garage, 576 SF barn w/stall, chicken coup, fenced pasture, fenced yard/dog run, mature fir trees & more! Listing provided courtesy of John L. Scott/Lvw.